Brian Goldfinger has been practising law long enough to have seen some very good practices from personal injury lawyers in Ontario; along with some very bad practices from personal injury lawyers in Ontario. When bad things happen to people; they often turn to Brian Goldfinger to right the ship and turn things around. In this instalment of the Toronto Injury Lawyer Blog, we pick Brian Goldfinger’s mind to find out some not so good stories from clients he has seen in the past in terms of what not to do when retaining a personal injury lawyer in Ontario. Meet with your personal injury lawyer: All too often, Brian Goldfinger has been approached by prospective clients with personal injury cases who are being handled by other personal injury lawyers or paralegals. When Brian asks them who their lawyer is; the client cannot say. When asked whether or not they have met with a personal injury lawyer, spoken to one, or corresponded with one in relation to their case, often the answer is a firm “no”. When pressed further, the truth comes out that they never met a personal injury lawyer before. Instead, they met with a non lawyer who called themselves a “consultant” or a “client care specialist”, or some other fancy non-legal title. These people are not personal injury lawyers. They are people who give themselves fancy titles. These people may act as agents or servants or employees for the law firm they work for or represent whose sole job is to run around the City or Province and get clients and sign up clients. Never meeting with or speaking with your personal injury lawyer from the start is recipe for disaster. When you hire a real estate agent, do you meet with that agent or do you meet with his/her agent or secretary? When you need to get surgery, do you meet with the surgeon ahead of time to discuss the procedure, or do you meet with the surgeon’s agent? The same applies when it comes to your personal injury lawyer. Know who you’re hiring. This deep freeze, thaw, cold, warm, snow, rain, back to snow, then to ice weather cycle we have seen across Ontario this winter hasn’t been good for anyone. We’re not sure if it’s snowing, raining, or ice is falling from the sky. All of the fluctuations in temperature have lead to slippery walking conditions on sidewalks, parking lots, entrance ways, walk ways and other paths. Over the months of February and well in to the beginning of March 2019, our law firm has seen a spike from the usual norm with respect to winter slip and fall cases resulting in serious injury. Injuries like broken ankles, broken wrists, broken arms, broken hips; even fractured skulls. We have been seeing some pretty significant injury cases of late. Friendly reminder that Brian Goldfinger and Goldfinger Injury Lawyers have been nominated by Canadian Lawyers Magazine as a Top Boutique in Personal Injury Law for 2019. In their own words, Canadian Lawyers Magazine is “looking for your input on the best firms specializing in personal injury law as well as the best arbitration chambers. Please choose the top ten firms from the list provided. If you do not rank at least five firms, your votes will not be counted. The survey only takes a few minutes to complete and you need not be a personal injury lawyer to do so. 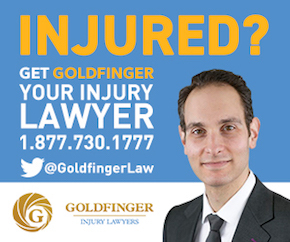 Brian Goldfinger and the team at Goldfinger Injury Lawyers would really appreciate your support. Here is the link to vote. Now that the public service announcement is out of the way, we can begin this week’s installment of the Toronto Injury Lawyer Blog. This week Brian Goldfinger would like to focus on privacy and personal injury law in Ontario. Believe it or not, these two areas of the law intersect more that you would think.